Is Beto O’Rourke the Democratic second coming? 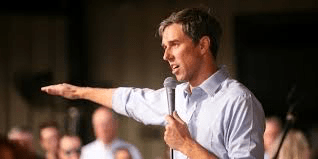 Democrat Beto O’Rourke just lost the race for US Senator from Texas …. From media reports you’d never know it…. It’s almost like some people are viewing O’Rourke’s loss like a tune-up…. Yes….For those of us around in the late 1960’s this a guy who could remind us of a young Jack and Robert Kennedy…. O’Rourke — who raised a stunning $38 million in the third quarter of his race — is widely considered capable of raising millions of dollars quickly, according to interviews with multiple Democratic money bundlers and strategists, catapulting him into the upper echelons of the 2020 campaign. O’Rourke raised more than $70 million in total in his bid to unseat Republican Sen. Ted Cruz, mostly from small donors in a race that captured national attention. Though he fell short — losing 51 percent to 48 percent — his closer-than-expected performance in the largest red state on the map was credited with lifting at least two Democrats to victory over House Republican incumbents. “He’s game changing,” said Robert Wolf, an investment banker who helped raise Wall Street money for Obama in 2008 and 2012. “If he decides to run, he will be in the top five. You can’t deny the electricity and excitement around the guy.”….